Cyclone Pam: perhaps worst cyclone in Pacific's history leads to “unbelievable destruction” in Vanuatu. 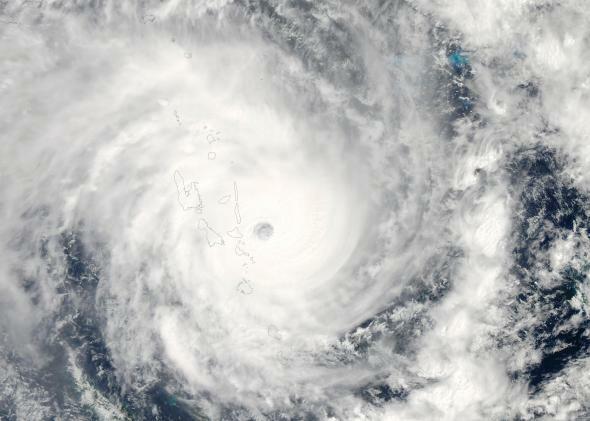 Cyclone Pam bears down on Vanuatu in this image from the Moderate Resolution Imaging Spectroradiometer (MODIS) on NASA’s Aqua satellite taken on March 13, 2015. Vanuatu President Baldwin Lonsdale called for international assistance. “I stand to appeal on behalf of the government and the people of Vanuatu that the global community give a lending hand in responding to these very current calamities … that have struck us,” he said, according to the BBC. The powerful cyclone contained winds of 168 miles per hour, according to the Associated Press. “I can say that for anybody who wasn’t in a secure shelter last night, it would have been a very, very tough time for them,” an aid worker said. Approximately 267,000 people live in Vanuatu’s 65 islands, about 47,000 of them in the capital, Port Vila. “It’s like a bomb has gone off in the center of the town,” said Alice Clements, a UNICEF spokeswoman said, according to the New York Times. “This will most certainly be a catastrophe for the people of Vanuatu.” It will likely be several days before the full extent of destruction is known, particularly considering communications are down across many of the islands. “The damage is quite extensive in Port Vila but there are so many more vulnerable islands. I can’t even imagine what it’s like in those vulnerable communities,” an aid worker said.